Haha, yeah. They like Ibrahim’s stories. And Ibrahim likes telling them, despite his grumbling. Also: Aw, good brother. And good story. There are certainly older bits of text out there. I chose Gilgamesh because it’s one of the oldest epics, and one known world-wide. Aww… It’s nice to see that the little ones enjoy the Epic of Gilgamesh. Unfortunately I’ve only ever read it in summary or in this graphic novel version I found at the library one day, but sheesh that story is cool. A demigod with super strength finds a man in the wilderness and becomes best friends forever with him and then they have cool adventures involving beating a rampaging animal to death and trying to learn the secret of immortality. What’s not to love? Jerky ? How would he be jerky ? He deserves a Medal of Honor for still being nice-nice with two little brothers that won’t let him work in peace and will pester him just because they find it “fun”. Hahaha, I guess that’s true! He basically does nothing but study though, so it’s hard to get him to do anything else. XD Also the one in white is a girl. Did you start this webcomic because you are of scandinavian ancestry, or just because you like the Norse/vikings history ? Well, considering how far and wide the Vikings traveled, I might very well have some in my blood. XD As for TMK, the Coal character came first, and I doodled him, and wanted to tell a story with him. His character was based on Vikings initially, so I just decided to make him one, and it spiraled out from there. Gilgamesh! A king! At Uruk! I never thought Ibrahim was a jerky brother. The whole time I was on his side. Where is their mother to corral the ankle-biters screaming “entertain me! entertain me”!? Being a scholar is a huge deal! They should be respecting it, not dissing it. But what the hey. It’s charming and beautiful nonetheless, as always. And Gilgamesh? I agree with Ceceoh and The doodler. This is a world where the gods go on quests with little dead warriors. Who says that the Gilgamesh that was found in the 19th Century was the only copy in existence a thousand years ago? I am still eagerly waiting to see the connection to Coal and Loki. Aw! Best big brother ever! Haha, he can be nice when he wants to be. Haha! That would be quite a story. Ibrahim is such a good brother. 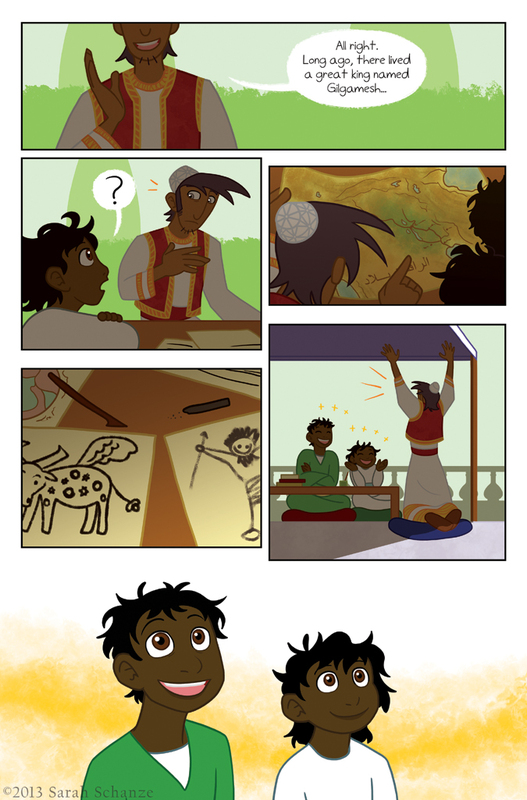 :3 I love the looks of wonder on his little siblings’ faces in the last panel. First time commenting but have been following this story for quite a while now and love it but for a couple of months ago had computer issues so I couldn’t check up on the story. Now I am back and I have fallen in love with the story all over again keep up the good work. Thank you! I’m glad you’re still enjoying the story. 😀 Incidentally, I got that book for Christmas! I’ve read the story of Sigurd and Gundrun in the Prose Edda (I think) but that’s just one version of it, and frankly I’ve forgotten quite a bit. Haha. So I see on Tumblr that you’re considering adding horns to Odinn. Ironically I found it rather neat and fitting that he was so plain in your depiction of him. In the myths, he’s always going around disguised as an unassuming old man, at least until he needs to turn on the whole “I am a GOD, FEAR ME” thing, as in the top panel of 1:19. So the way you drew him seemed to work quite nicely, actually. Thank you! I was playing around with the idea, mostly. I do think his design is just a bit too plain and simple, but it might just mean me sprucing up the lines a bit, maybe adding some detail to his clothes, not necessarily overhauling the entire appearance. I don’t know! Guess we’ll see. XD Thank you!